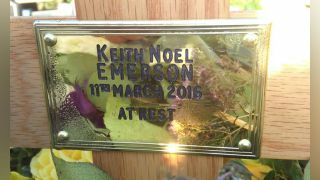 Keith Emerson was laid to rest at a private ceremony on Friday by his family, after his tragic death at the age of 71 last month. The Emerson, Lake and Palmer icon’s passing was ruled a suicide after he was found at home in Los Angeles with a self-inflicted head wound, leading the prog world to pay tribute. His son Aaron Emerson, also a musician, posted a picture of his father’s grave yesterday and said: “I would like to thank all the thousands of people who have sent messages of love and condolences to myself and my family after the passing of my father.